The Enforcer AR Pistol Grip is a drop in replacement that mounts to any standard mil spec lower receiver. Available in 9 different colors! Please choose your color above. Weighing in at just over 4oz it does not add unnecessary weight to your rifle. 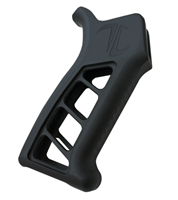 This skeletonized grip is CNC machined from a solid block of aircraft grade billet aluminum. Made in the USA!